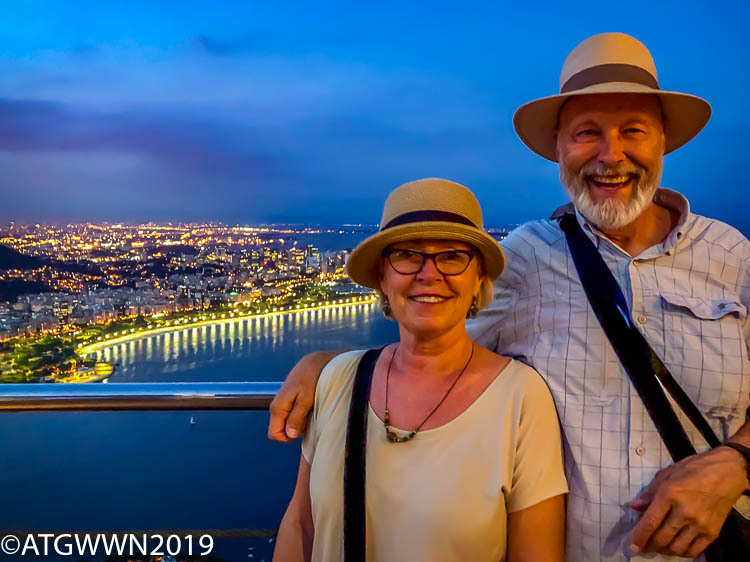 While “Three Days in Rio” sounds like a great movie title, I’m going to share my three days with you on my blog even though the days were filled with action, blazing colors, artistry, and of course, incredible gardens. 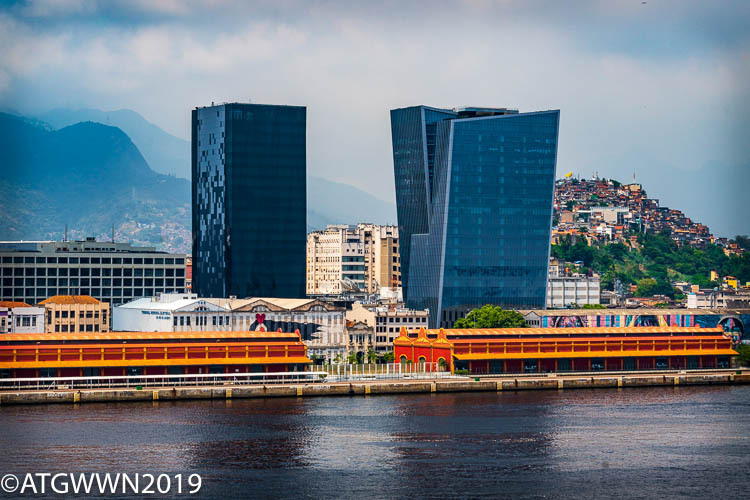 Our cruise ship sailed into Rio de Janeiro harbor at noon on a bright sunny day. This is an incredible view of a geographically beautiful harbor. The mountain peaks rise out of the sea, surrounded by sparkling blue water, and the ship dock cranes stand out in bright orange. 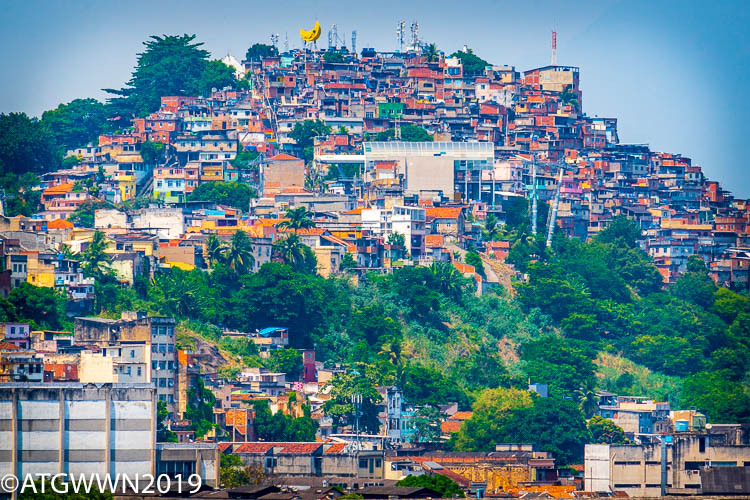 The high rise architectural wonders claim the prime ground, and the favelas sit in the hills. 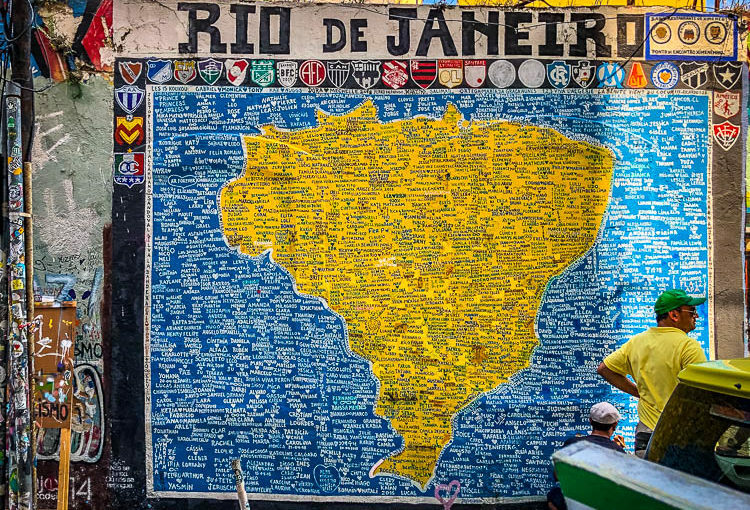 We docked in front of the Olympic Games legacy project heralded as the largest street mural of the world. 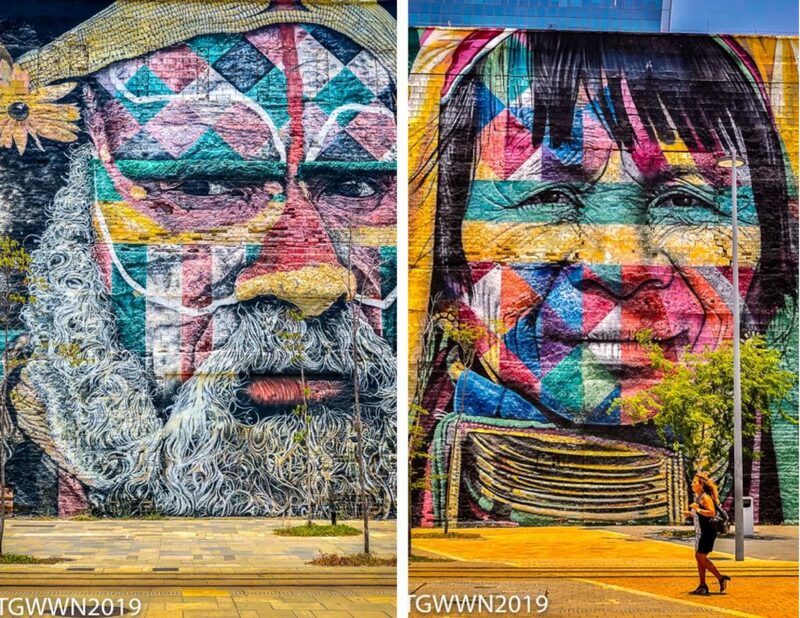 Painted by Brazilian artist Eduardo Kobra. 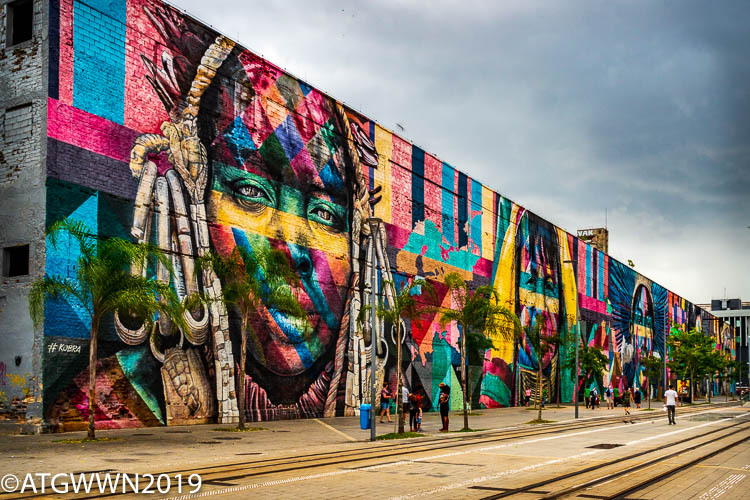 Kobra “studied the features of people from five continents that represent the black, blue, green, red, and gold rings on the Olympic flag.” The result is a compelling artwork that celebrates our common humanity. We met our tour guide, Anna Maria, a retired English teacher, and lover of architecture and culture, to get our first look at the city. 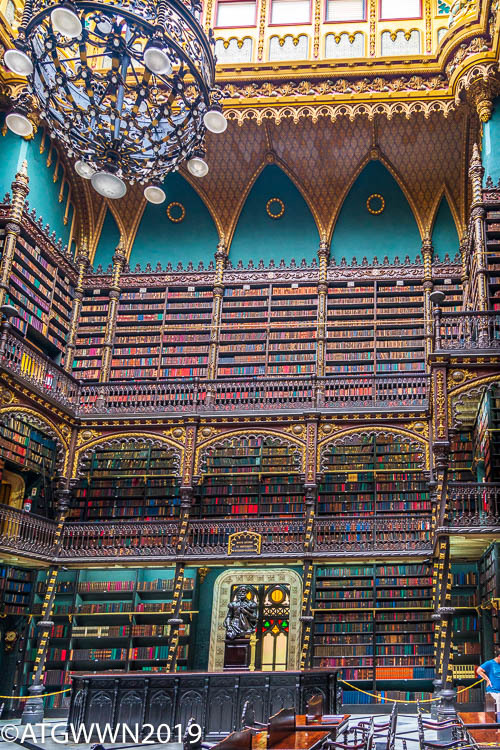 At our request, we began at the Portuguese Reading Room founded in 1837 and built in 1880 with a stain glass dome and soaring shelves of books. There is still a librarian to assist patrons though most of the collection is now available digitally. I stood there in awed silence trying to imagine the enormous collection of ideas, adventures, opinions, and research held in this room. 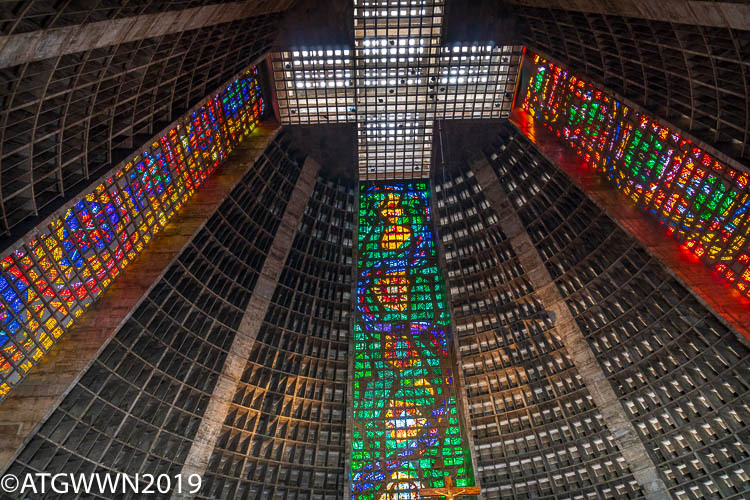 “This massive Brazilian church is built like an angular, technicolor pyramid left by Mayans from the future.” Just walking inside is a thrilling experience. My primary interest in our exploration of Rio was to see first-hand the work of Roberto Burle Marx, (1909-1998) whose 62-year career as a modernist landscape designer, painter, textile artist, sculptor, jeweler, pianist, chef, environmentalist, plant collector, and Brazilian hero left his mark on this enormous country, the fifth largest in the world by size. 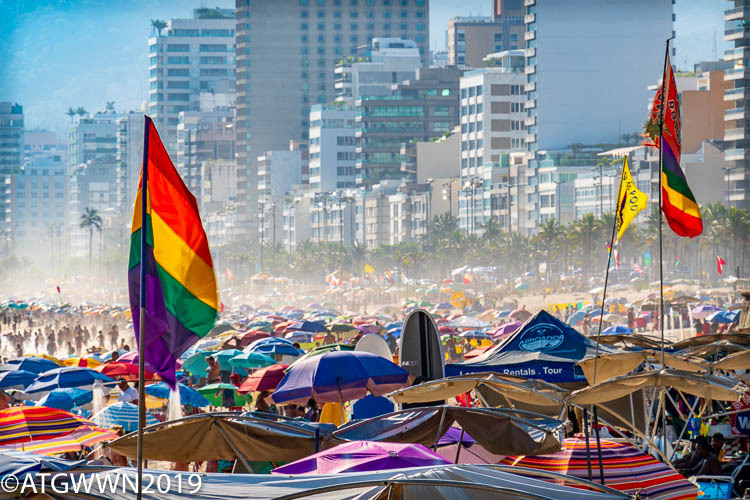 Aside from learning about the Amazon River in my geography classes in school, I long ago connected with Brazil through “The Girl From Ipanema” and Stan Getz so I knew beaches and bikinis were famous here. 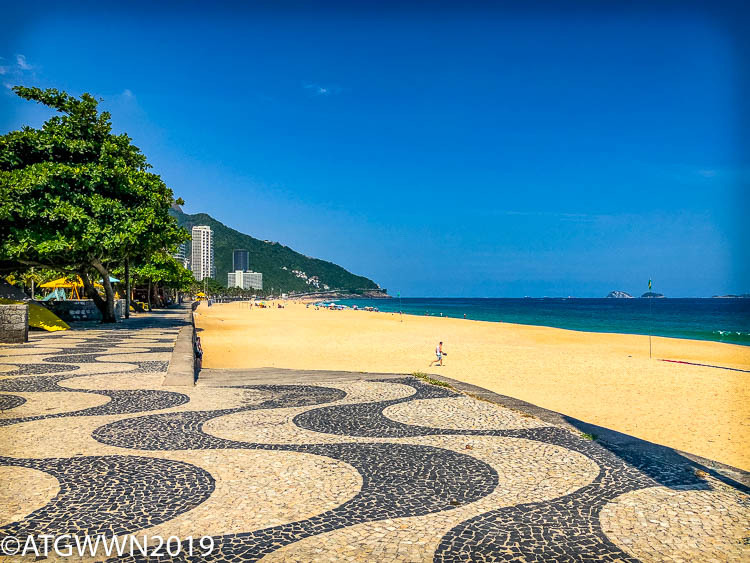 Ipanema and Copacabana Beach are two of many white sandy beaches in the city. 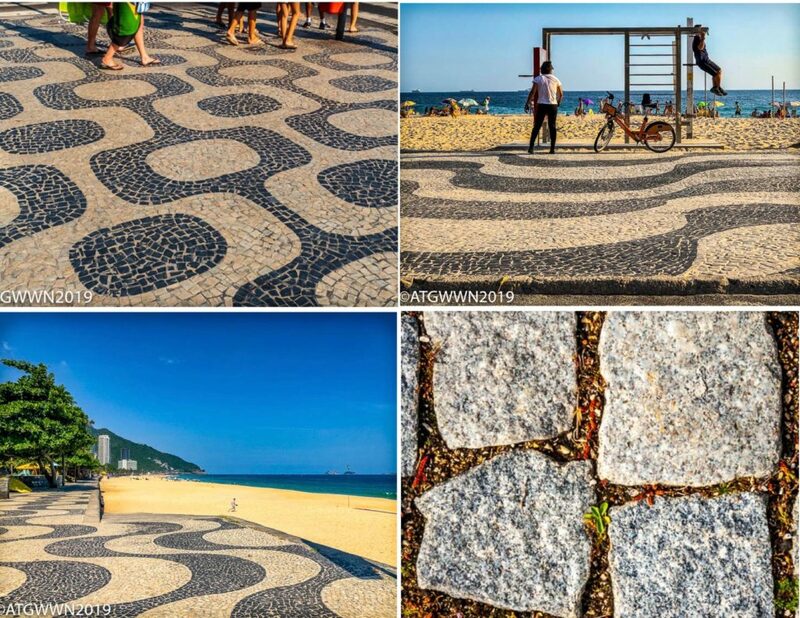 Burle Marx designed the landscape of the 2.5 miles (4 km) Copacabana Beach. 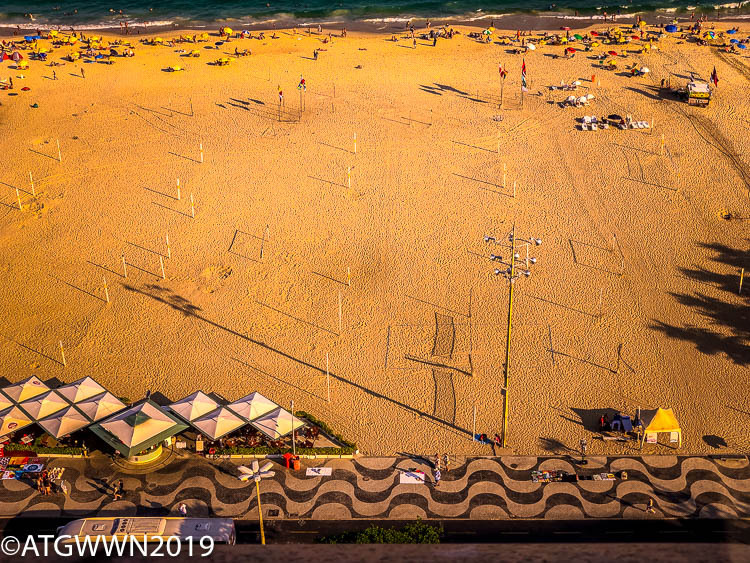 The Copacabana Beach landscape includes the amorphous, non-symmetrical patterns of basalt and limestone tesserae, each the shape of a cube, hand formed by craftsmen who laid the pieces one by one onto a bed of gravel before mortaring them into place. 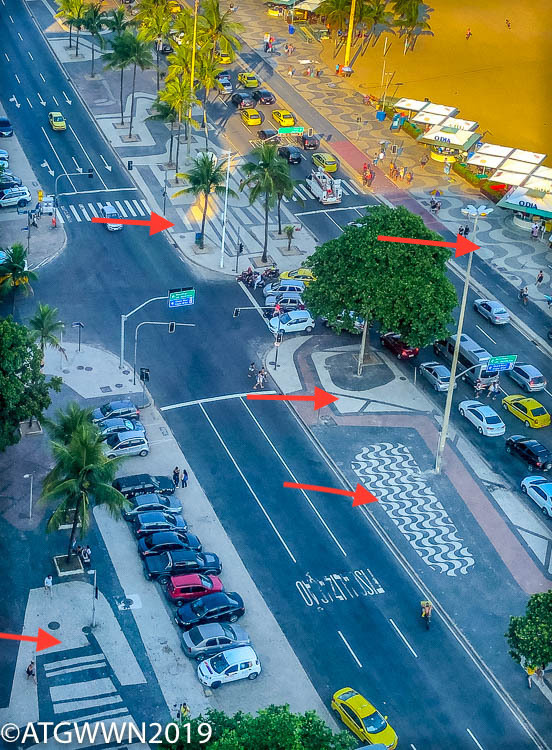 Burle Marx’s designs do not repeat in the entire length of the beach walkway and the street median. He included stands of trees for shade and shape integrating nature into the space. As you walk along the beach you see the movement of a pattern at your feet but my goal was to see it from above, so we took the elevator of the Marriott hotel up to the rooftop bar to get a good look. Since the promenade was installed in the 1930s the street has been widened, trees have died, and things have changed, but the identity of the space remains and its uniqueness undisputed. The view of the pavement landscape is exciting to see even though snack bars, umbrellas, cars, and people compete for your attention. Of course, unless this landscape had been put into place, all that is happening here today wouldn’t be possible. In his lectures, Burle Marx passionately believed in the importance of placing nature within the urban environment. He is famous throughout the world for his designs of public spaces to provide dignity for the masses. Long before our current focus on biophilia, Burle Marx advocated for man’s need for nature saying, “find rest, relaxation, recreation, and above all the feeling that his (sic) is living in, and integrated into, this space.” People want to come to the beach. Integrating a landscaped connection to nature makes it possible for some 7 million people to live crowded together near the coast. 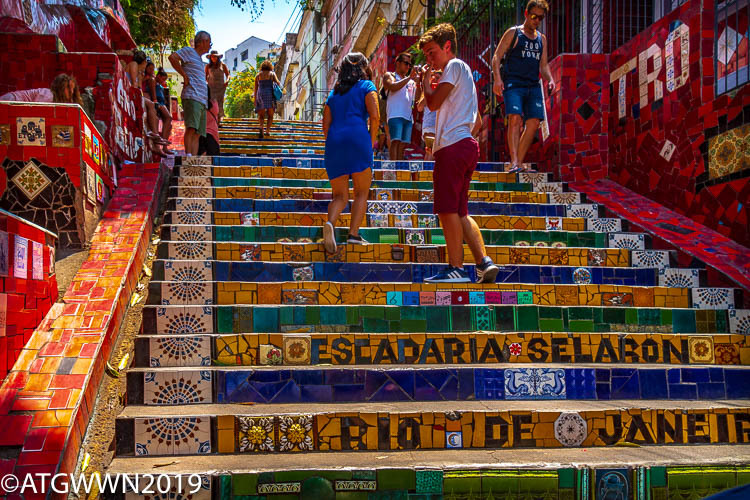 We drove on to the Escadaria Selarón Mosaic Steps, 250 tiled steps and surrounding walls started by the artist to decorate the space outside his apartment that eventually became a masterwork that he labeled a “tribute to the people of Brazil.” Each time I see such an original work of art, it inspires me to consider the possibilities of creativity we all possess if we just dare to begin. Our last stop was a sunset view from Sugar Loaf mountain. Back when sugar was a rare and precious commodity it was shaped into cones for storage; therefore the mountain’s shape inspired its name. 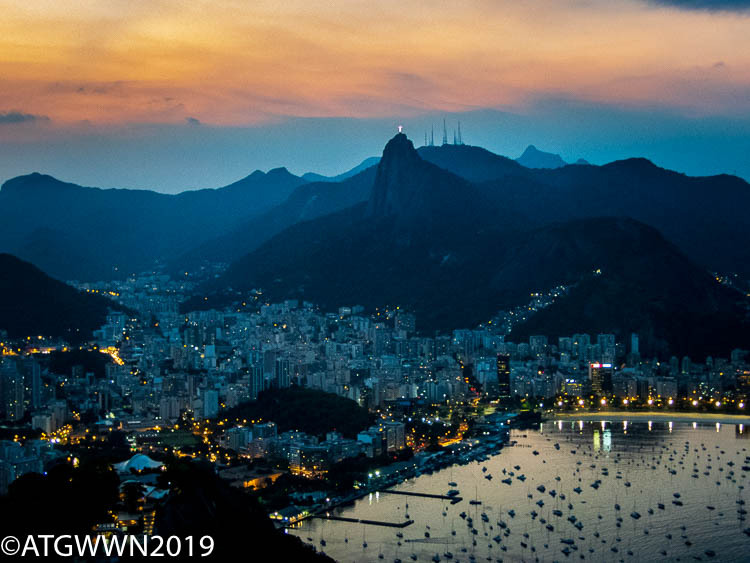 Today you take two cable cars to reach the top where you can look across to Christ the Redeemer statue and enjoy the cool evening breeze. As the sun sets, the city lights up accenting the curves of the coast, and there we ended our first day in Rio. In the pictures of the wildflowers (hillside homes) it looks like a big, yellow banana near the top of the hill. Is it? Yes, it is a big yellow banana but I don’t know why it is there! 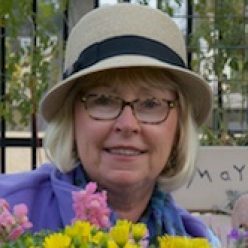 Your pictures are wonderful Linda! Thank you for sharing them!! Really enjoyed the pictures. This is a great opportunity to see the world and remain home. Can’t wait to see you. Wonderful pictures! Several years ago I spent a week in Rio and had a great time. 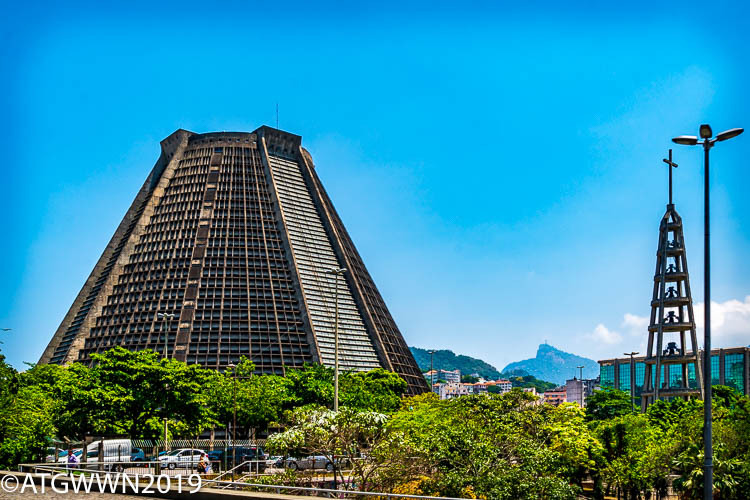 Next Next post: Day Two, Three Days in Rio!